Do you know what’s really hard??? Taking a picture of your pants while you are still wearing them. Anyway, I always seem to get a hole in the left knee of my blue jeans. Always the left. And I’m always patching them, although I’m constantly on the lookout for new and better ways to patch. This method comes from a book I got at the Thrift Store: Creative Activities …Program (Sewing). I got it for my kids, when they’re old enough. But it turns out, I’m not too old for it myself. I love the red you used. Makes a nice impression. That looks so great…enough to PUT a hole in your jeans on purpose! 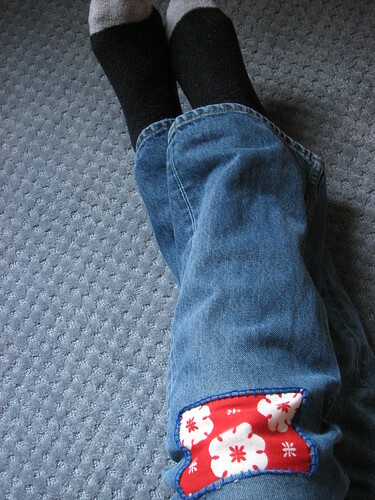 As I heard a rip in my jeans when I knelt to read a story to my 3 year old, I wondered whether other mums had trouble with holes in the knees of their jeans. I needed some patching inspiration! Thanks!